Peter Svidler and Valentina Gunina have won the Russian National Chess Champion 2013. Svidler wins the title for a record seventh time, while Gunina wins it for the second time. Svidler beat Ian Nepomniachtchi in the tiebreak. In the last round, Ian Nepomniachtchi was able to capitalise on a blunder by Vladimir Kramnik to catch up with Svidler as the latter drew a game with Sergey Karjakin. 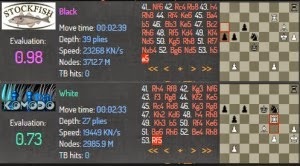 Svidler and Nepomniachtchi then faced each other in a 15-minute rapid playoff which was won by Svidler 1.5-0.5. Also, Nikita Vitiugov was able to beat Vladimir Kramnik for the third spot on a better tiebreak score. GM Valentina Gunina drew with GM Alexandra Kosteniuk to become the Russian Women's Chess Champion 2013. Kosteniuk ended just half-point behind the winner and is the Women's Vice-Champion of Russia 2013. Gunina and Kosteniuk went into the last round with only half point as a difference. While Gunina needed to draw to win the title, Kosteniuk needed a win. In fact, the 12th Women's World Chess Champion got out of the opening with a winning edge but, the hard-fought game drifted into a draw eventually. Valentina Gunina and Alexandra Kosteniuk very much set the pace of the tournament ahead of the rest of the field which was bunched together a full point away. The Russian Chess Championships (known as the Russian Super Final) for men and women was held from 5th to 14th October at the State Historical and Architectural Museum in Nizhny Novgorod. 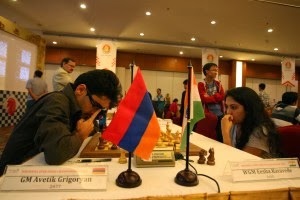 Both events were held according to the round robin system with 10 players each. The total prize fund for both groups is 6 million RUB (approx 138,000 EUR). You can find games and detailed tournament updates at the official website of the Russian Chess Federation. 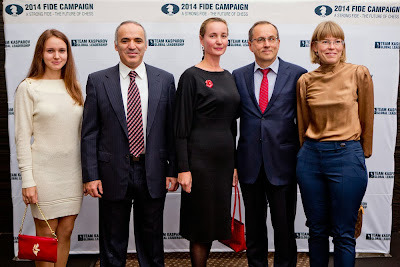 The tournament was organised by the Russian Chess Federation in cooperation with the Charity Foundation of Elena and Gennady Timchenko with support from the Government of the Nizhny Novgorod region. Continuing with the tradition of 'Chess in the museums' begun by hosting the Anand-Gelfand World Chess Championship 2012 at the Tretyakov Gallery in Moscow on the initiative of businessmen Andrei Filatov and Gennady Timchenko, the Russian Superfinal The venue for the prestigious tournament in Nizhny Novgorod will be the State Historical and Architectural Museum Manor Rukavishnikov. The Nizhny Novgorod State Art Museum also took part in the organisation of the tournament. Here are two photos of the very talented World No. 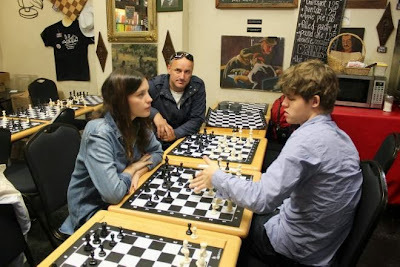 1 Magnus Carlsen across the chess board with two very interesting (and talented young ladies). Can you name the girls? The first photo is by Espen Agdestein (World No. 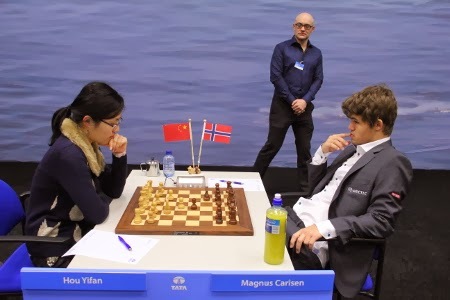 1 Magnus Carlsen's manager) and the second photo is by Tata Steel Chess Press from the tournament earlier this year. For the answers, just select with your cursor (horizontally) the white space after this colon: Liv Tyler and Hou Yifan. 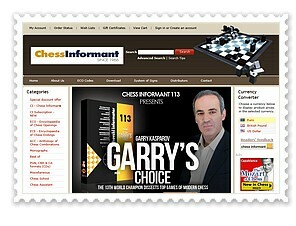 Hope you are also following our special articles at www.worldchesschampionship2013.com on the 2013 World Chess Championship Match Viswanathan Anand and Magnus Carlsen coming up in November. 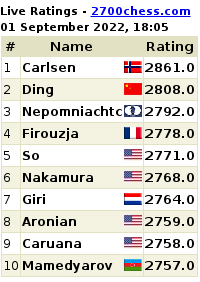 Carlsen leads our online poll so far and you can vote at the site as well for your choice of the World Chess Champion 2013! NDTV Video @25 Walk The Talk: Chess Grandmaster Viswanathan Anand speaks to Shekhar Gupta about his successes and failures and his journey to the top of the game. For full coverage of the 2013 World Chess Championship 2013 between Viswanathan Anand and Magnus Carlsen visit www.worldchesschampionship2013.com. After the intense battles of the first two days of Indonesia Open 2013, round three was seemingly a relatively peaceful affair, but even if there were draws amongst the leaders on the top four boards, all were not with fights. 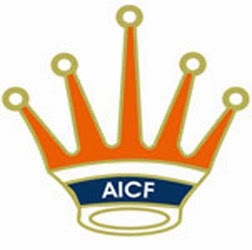 GMs Alexander Moiseenko, Vaibhav Suri, Nigel Short, Vadim Malakhatko, John Paul Gomez, Aleksey Dreev, Gundavaa Bayarsaikhan, and Surya Sekhar Ganguly were therefore joined by GMs Antoaneta Stefanova and Igarza Renier Vazquez who had the only really quick draw and Hoang Thanh Trang who held off Jaan Ehlvest on 2.5/3. On board five GM Ivan Ivanesevic won against GM Darwin Laylo and on board eight the unfancied, but very determined GM Avetik Grigoryan stopped giant killing local FM Anjas Novitas to take the lead. Ivanisvic and Grigoryan will play each other in Round 4 on the top board. Notable other leading results include GM Eduardo Iturrizaga beating GM G N Gopal, GM Oliver Barbosa prevailing over IM Denny Juswanto, GM Sandro Mareco proving too good for IM Sadikin Irwanto, GM Ehsan Ghaem Maghami edging WGM Tuvshintugs Batchinmeg and Indonesia’s No. 1 GM Susanto Megaranto outplaying veteran countryman GM Cerda Barus to move back into contention, also with 2.5/3. So we have two players on 3,0/3 and no less than 18 players with 2.5/3 going into round 4 and there are some exciting match-ups that might help determine the final winners! Watch live at official website.